Gluten Free Sourdough Banana Bread | GF-Zing! 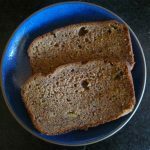 Sounds like you use an awful lot of sugar in this recipe – would it work with substantially less? I have not tried reducing the sugar, but it seems like you could reduce it some. I’d reduce it in increments of 1/4-1/2 cup. Sometimes when you reduce sugar the resulting baked product is too dry. Write back and let us know if you have success reducing the sugar. Happy baking! Sourdough banana bread! Genius! I never thought to combine two of my favorite things like this. I will definitely be trying this recipe this weekend. Thanks for posting!